In the late 1960s, the oil companies knew they needed a pipeline to get Prudhoe Bay oil to market, and they needed the U.S. government to grant permits. But just as this was happening, the environmental movement was taking hold in America. With the pipeline turning 40, we look back at how Big Green fought Big Oil, how that fight transformed the Trans-Alaska Pipeline, and why Congress ever agreed to it. 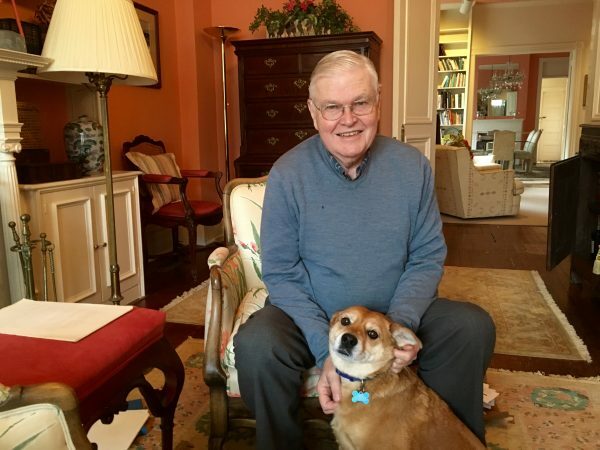 Attorney Jim Moorman and his dog, Ginger. 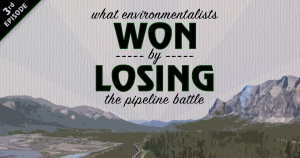 He filed the lawsuit that forced the oil companies to design a better pipeline. The case also showed a brand new environmental law had teeth. Sections of 48-inch pipe were already en route to Alaska when an attorney in Washington, D.C. named Jim Moorman got a call. It was the founder of Friends of the Earth, asking if he could stop the pipeline. Moorman said he’d heard of the project. He’d read a newspaper article that made the pipeline sound like a horror show. So the attorney looked for anything he might use to prevent this disaster. And he didn’t find much. In 1969, there were very few environmental laws, and none that really applied to this situation. Government could essentially permit a pipeline of whatever quality it deemed fit. Then, Moorman said a gift arrived, from Capitol Hill. Today, NEPA is a big deal. It requires an “environmental impact statement” for major projects the federal government it funds or issues permits for. The law allows ordinary people the opportunity to influence a project, and it’s been used as a tool for delay in court. But when Congress passed NEPA in late 1969, the talk was all lofty, about making environment a national priority. Hardly anyone was focused on the nuts and bolts of it. So it almost went unnoticed that the new law required federal agencies to write a “detailed statement” for each project it considers. Jim Moorman, the environmental lawyer? He noticed. “That was a bit of bombshell for me,” Moorman said. The “detailed statement” though? Nobody knew what that meant exactly, or if the courts would enforce it. But Moorman’s clients – Friends of the Earth, The Wilderness Society and the Environmental Defense Fund – wanted to stop the pipeline, and they thought this new law could help. In the spring of 1970, when the government was ready to issue permits, Moorman asked the Interior Department for its “detailed statement” on the pipeline. What Moorman got back, the document that was supposed to list all the environmental effects of this trans-Alaska endeavor, was just eight pages. Eight pages. For 800 miles. Moorman sued the feds, arguing the 8-page statement didn’t comply with NEPA. Moorman remembers being nervous when the case went to court. In Alaska, workers were literally unloading pipe in the port of Valdez. But then they won. The judge agreed the government’s impact statement was inadequate. Moorman proved NEPA had teeth, and he brought the largest project in Alaska history to a halt. “This is a little corny: I had a moment of euphoria. 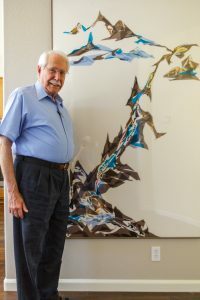 The only other time I had such a feeling of euphoria is when I got married!” Moorman said. The environmental lawsuit forced the oil companies to spend three more years and a small fortune on engineering, analysis and documentation. Gone was the idea of just putting a hot pipe in frozen ground. Engineers got to work designing elevated sections, insulated sections, sections on sliders so the pipe could flex in an earthquake. But all this took time. 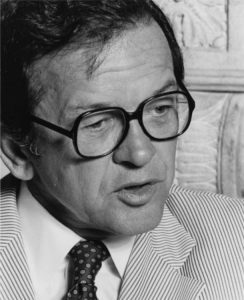 In 1971 Sen. Ted Stevens took to a Senate recording studio to explain to the folks back home why there would be no pipeline that year. He said Congress, by passing NEPA, had forced them into a strange new set of procedures. This was the birth of the defensive Environmental Impact Statement, the encyclopedic EIS we know today. The government held hearings on the pipeline in Anchorage and Washington. Several thousand people testified or submitted comments, most of them against the project. You can practically hear the bureaucracy’s head exploding at the work it took just to listen to the public. That was just the start. The final environmental impact statement stretched to nine volumes. Proponents said no project in American history had ever been so thoroughly scrutinized. The Interior Department announced in the spring of 1972 it would grant permits. And the environmentalists went back to court. It was now clear to pipeline supporters that the lawsuits could drag on for years. Some members of Congress decided there was no time to let the NEPA challenge play out in court. 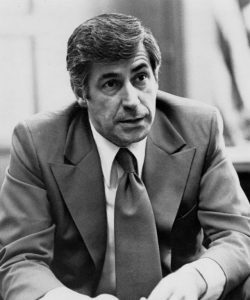 Sen. Mike Gravel was one of them. He’s intensely proud of his work in 1973 to convince Congress to allow the pipeline. There were bills to authorize the pipeline in both the House and Senate. The Senate version would not have ended the NEPA lawsuit. So Gravel wrote an amendment that said NEPA’s requirements had been met. That would have ended the lawsuit, but he sid everyone, even the oil companies, were mad at him. 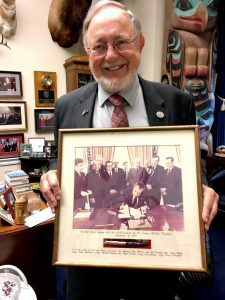 Alaska Congressman Don Young, then in his freshman year, says Gravel was trying to steal the victory for himself. Young, Stevens and the oil companies thought they could get the NEPA waiver through the House bill. That would avoid a public vote on the amendment in the Senate. Because doing an end-run around NEPA was very controversial. And if Gravel lost the vote, if the Senate was on record against the NEPA waiver, that could have killed it, and then there might never have been a trans-Alaska Pipeline. In the end, the Senate vote was dead even. Vice president Spiro Agnew broke the tie. But even then, the bill might not have made it to the president’s desk if it weren’t for world events. In October 1973, war broke out in the Middle East. The oil producing countries of the region, angry at the U.S. for supporting Israel, imposed what was called the Arab oil embargo. For the U.S. it made an existing fuel shortage worse, and jacked up the price of gas. With the country in crisis, America decided it really did want Alaska’s oil, and in Congress, the last opposition to the Alaska Pipeline disappeared. The final bill passed with huge margins and President Richard Nixon signed it into law in November 1973, clearing the way for construction to begin. The result of that long fight is a pipeline that’s considered a wonder of engineering. And Maybe the Trans-Alaska Pipeline would have been well-engineered anyway, but it was NEPA that forced the oil companies and the government to prove it. This story is taken from Episode 3 of an Alaska Energy Desk podcast called Midnight Oil. To hear more go to Alaskapublic.org/midnight-oil or subscribe wherever you get your podcasts.